Uber Eats Reviews: Right Food Delivery Service for You? 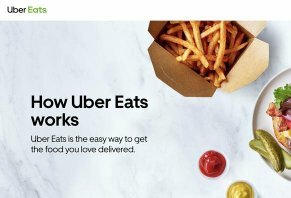 Since 2014, Uber Eats has expanded their food delivery service to dozens of global cities and now provides access to more than 50,000 restaurants. Uber Eats: Right Food Delivery Service for You? The Uber Eats app promises to help connect you with your favorite local restaurants and chain favorites in 50+ cities across 13 countries, and have food you love delivered to your door seven days a week. According to the website, all you have to do is download the app, add your delivery address, find the food you crave, and tap to place your order. You can pay using your existing Uber account, and then track your food in real time as it’s prepared and makes its way to you. With all of the food delivery apps out there, is there anything—whether good or bad—that distinguishes Uber Eats from the competition? Using this information, how can you make a more empowered decision about the best delivery service for you? Keep reading, and these are the two core questions we’ll focus on in this article. Where Does Uber Eats Deliver? Uber Eats offers order delivery in the following countries (taken directly from their app listing at the time of writing): Australia, Belgium, Brazil, Canada, China, Colombia, France, Japan, India, Singapore, South Korea, Mexico, New Zealand, Poland, Russia, South Africa, Spain, Taiwan, Thailand, United Arab Emirates, United Kingdom, and United States. Specifically, in the following cities and metro areas: Abu Dhabi, Adelaide, Amsterdam, Atlanta, Auckland, Austin, Baltimore, Bangkok, Bogota, Brisbane, Brussels, Cape Town, Chicago, Dallas, Denver, Dubai, Hong Kong, Johannesburg, Glasgow, Liverpool, London, Los Angeles, Madrid, Melbourne, Mexico City, Miami, Milan, Moscow, Mumbai, Nashville, New Delhi, New Orleans, New York, Ottawa, Paris, Philadelphia, Rio de Janeiro, San Diego, San Francisco, Sao Paulo, Seattle, Singapore, Stockholm, Sydney, Taipei, Tokyo, Toronto, Vienna, Warsaw, and Washington DC. From a functionality perspective, Uber Eats isn’t unlike many of the other food delivery services we’ve written about. For each of these options, you’ll see the name, price range (indicated by dollar signs), estimated delivery time, average user rating and a number of reviews, and the booking fee. Clicking on a restaurant will display the menu items available. Tapping on an item gives you the opportunity to read a brief description, choose options or substitutions (when available), and write down any special instructions or modifications to a dish's ingredients or the way it’s prepared. If the restaurant can’t accommodate, they’ll reach out to you directly. Then, select the desired quantity and press the Add to Cart button. When you’re ready to go, you can review the total (including tax and booking fee), press the Checkout button, log into your account, confirm delivery time and location, enter payment details, and then place your order. The restaurant will then prepare your food, which will be picked up by an Uber partner and delivered to your door (you can meet them at the curb if that works better for you). En route, you’ll be able to see their name and photo and track their progress on a map. In addition to these fees, you’ll have the ability to tip your Uber Eats deliveryperson and rate your experience directly in the app. There were more than 950K combined user reviews for the Uber Eats app between iTunes and Google Play, who had given it an average rating of about 4.5 stars. Compliments commonly related to ease of ordering food, on-time deliveries, and a robust selection of restaurants. Complaints commonly cited incorrect orders, long delivery times (often due to a delay in someone picking the food up), high fees, functionality issues with the app, and difficulty reaching customer support. A company representative responded directly to many of these. Several other large food delivery apps are competing for many of the same customers as Uber Eats, including DoorDash, Postmates, Grubhub, and Caviar, to name just a few. How do they compare? Uber Eats 50+ cities around the world 50K+ Food: Can be different than in-restaurant Fees: Assessed by restaurant. Also, busy fees assessed when relevant. DoorDash 600 cities N/A Food: Same as in-restaurant (in most instances) Fees: Variable delivery fee depending on order total and special requests. Postmates Hundreds 100K partner merchants Food: Same as in-restaurant Fees: Delivery fee between $3.99 and $9.99. $1.99 small cart fee. Blitz pricing during busy times. Grubhub 1,600+ U.S. cities 85,000+ restaurants Food: Same as in-restaurant Fees: Variable delivery fee set by restaurant. Caviar 12+ US cities N/A Food: Varies, depending on restaurant Fees: 18% service fee, $1.99 delivery fee. Taking a look at these details, with food that can be priced higher than in-restaurant, along with variable booking charges and busy pricing surcharges in many instances, Uber Eats seems to be one of the more expensive food delivery options currently available. And while it’s positive that they operate in more than 50 global cities, DoorDash provides service in more than 600, while GrubHub exceeds 1,600, although all of these are concentrated in the U.S. DoorDash, Postmates, and Grubhub offer pricing that’s the same as in-restaurant, while DoorDash and Grubhub also allow restaurants to set their own delivery fees (if any). Let’s go ahead and pull everything we’ve discussed together and come to a conclusion about your future with Uber Eats. Making a decision here isn’t exactly rocket science. In fact, outside of the high-level details outlined in the previous section, the right food delivery app is going to primarily revolve around personal preferences, which will obviously be different for everyone. In other words, no single service is going to meet everyone’s needs. Still, Uber Eats seemed to have a mostly positive online user reputation among their nearly one million reviews between iTunes and Google Play. And if something less-than-stellar occurs during your order, the company promises to help make things right. Write a Review for Uber Eats!